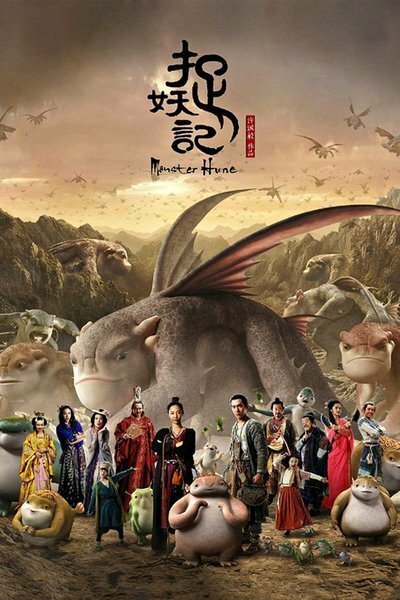 Chinese blockbuster "Monster Hunt" is a sappy, crowd-pleasing, tonally wonky fantasy-adventure/comedy that pits dorky-looking monsters against over-acting cornball comedians/monster-hunters. It is silly, and ungainly, and weirdly violent (though in an appreciably cartoony, mostly implied kind of way). But, don't be afraid parents, grandparents, and legal guardians. You should see this film. See it with your grade-school-aged kids, their equally young friends, and whatever kids you can find loitering around a theater near you that happens to be showing "Monster Hunt." This film is pleasantly cheesy, and probably more interesting than anything that's currently being marketed to your not-so-picky kids. Try it, they'll like it. "Monster Hunt," a film that broke China's opening day box office record, takes place in a fantasy, pre-industrial world where men and monsters co-exist. The monsters are CGI creatures that look like the companies that make Peeps and Beany Babies made an unholy alliance, and created cuddly, fat, sub-humanoid amphibian creatures with Peter Lorre's sunken eyes and a physique like those creepy-looking Martian Popping Thing toys that still haunt my dreams. The film's plot is a bit convoluted, so let me break it down as simply as I can: monsters aren't welcome in the human world, so they are banished to the forest ... type area. But the humans' Monster Hunter Bureau is getting antsy without monsters to hunt, so they hatch a plan to kill the newly-deposed—and heavily pregnant—monster queen's baby, thereby causing anarchy in the monster world, and giving the otherwise dormant Monster Hunter Bureau new work. Rural mayor Tianyin (Boran Jing) gets impregnated by the monster queen despite the fact that he's a male. And he has to bear the queen's child and raise it with the help of amateur monster-hunter Xiaolan (Baihe Bai) while everyone tries to either eat or rescue the future monster king. Yes, I said "eat." There's a peculiar amount of goony food-related humor and violence that would earn the film a PG-13 rating if the film had a rating. Gags involving the deep-fat frying, dicing up, and steaming of monsters can be disturbing given how hard the film's animators try to make their monsters look cute, and cuddly in an "E.T. : The Extra-Terrestrial"-kind of way. There's also a lot of silly slapstick that doesn't always work, including crude fart/poop jokes, and a gag about breast-feeding a monster-child who suckles on blood (don't worry, you only see two pin-pricks of blood in this scene). You also get some endearingly off-kilter jokes about butts, and monsters, and eating things you probably shouldn't, and a corny, but sometimes effective, love story about raising a family. And oh, yes, lots of energetic CGI action scenes and unabashedly silly plot points. The story never goes anywhere unexpected, but really, you should see "Monster Hunt" with your kids. It is silly and over-the-top and a great time-killer. I mean, let's be honest, you see much worse movies all the time with your kids, right? That's what love is, seeing "Monster Hunt" with your children. Now get your coat on, let's go before your young charges try to drag you to "Norm of the North" or the latest "Alvin and the Chipmunks" sequel again!